Arianna Berardi will be teaching Yin & Vinyasa Yoga ! In this Vinyasa & Yin lab we will explore two different worlds of yoga. Literally, Vinyasa means “to place something in a special way”. In a Vinyasa flow, which will be the style of half of the classes, we will coordinate breath and movement, moving into asanas (poses) in a flow-like way. 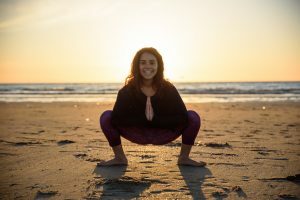 In these classes, you will experience the dynamic and energetic nature of a Vinyasa flow, getting in touch with your body in a fun and challenging way. In the other half of the classes we will explore Yin yoga: a relatively recent style of yoga that combines knowledge from Traditional Chinese Medicine with the more traditional Indian asanas. During a yin yoga class, you will hold poses for 3 to 5 minutes, diving into a meditative state, letting go and releasing of any tension. By finding stillness in a pose for long, yin yoga aids the fluidity of our fascia, a deep sheet of connective tissue that surrounds our muscles and organs. Sounds intriguing, doesn’t it? The goal of this lab is to make yoga accessible and enjoyable to as many people as possible, no matter the age, physical condition or level of acquaintance with yoga. Everyone can join and enjoy! The classes are based on free donations, which means “give what you like/ what you can”. The lab will start on May 2 , classes will be every Wednesday at 6 pm. Doors open at 5.45 pm. In the first class, we will begin exploring Yin yoga. Bring your own mat if you have one, there will be four mats available in case they are needed. Comfortable clothes are advised, together with a warm sweater or jumper for the final phase of the yoga practice. I am really excited to embark on this journey, and looking forward to meeting plenty of curious and passionate yogis!